We set out to see the Tower of London, the Globe Theatre, St. Paul's Cathedral and the Old Bailey. Some lunatics decided to place bombs in the tube system which made the day a Royal Pain. Erin found Dr. Who's Tardis and we watched a Shakespeare Play in Portuguese. Here is some of what we saw. 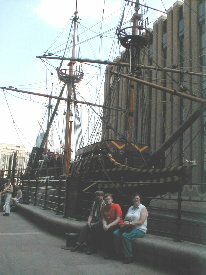 Sir Francis Drake's ship the "Golden Hind". This is a full-size replica. 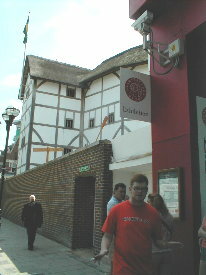 the Globe Theatre... more later. 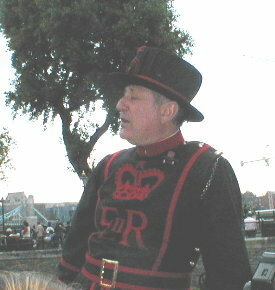 Our guide, a "Warder", better known as a "Beefeater", enthralled us with tales of the bloody and brutal history of the Tower. 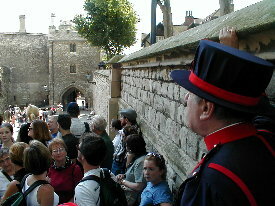 Thousands of criminals, both high and low, walked from the Tower to the place of execution, paid the executioner a "tip" for a clean kill, following which their headless bodies were returned to the Tower and thrown into the moat. 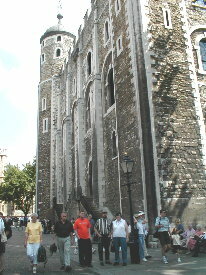 The Royals were executed in the courtyard of the Tower itself and were then buried under the floor of the Chapel. 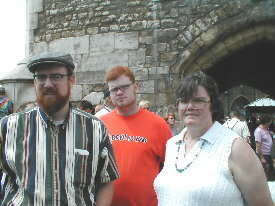 These folks are waiting for the return of the executioner. 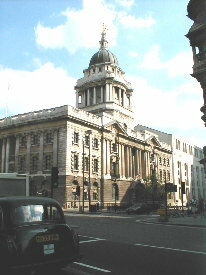 This is "Old Bailey", London's criminal court. Elliot and Tom watched part of a burglary and murder trial and enjoyed the wigs, robes and pomp. 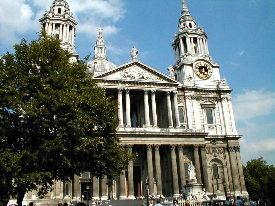 St. Paul's Cathedral, in the heart of London, is the seat of the Church of England, which as you recall was begun because the Pope refused an annulment to King Henry VIII. 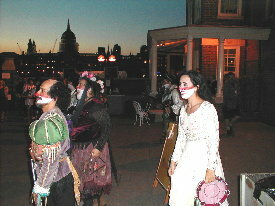 A street theater group from Brazil presented Shakespeare's "Romeo and Juliet". 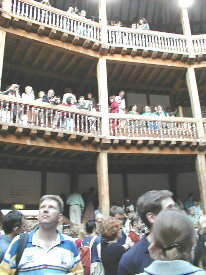 Tom and Elliot enjoyed this performance at the Globe. Although neither of us spoke Portuguese, we had both read the book and were fairly sure how it came out. Elliot, and an unknown admirer, studied up on the program notes to help in the translation. 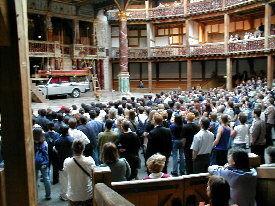 In order to understand what part the Volvo played in the performance, you had to be there! 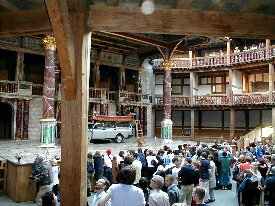 The inside of the Globe mirrors the building where Shakespeare performed and had his works performed. 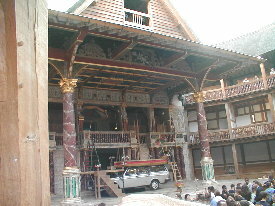 After the play the actors in traditional street-theater makeup circulated among the audience smiling and nodding in response to the English compliments. 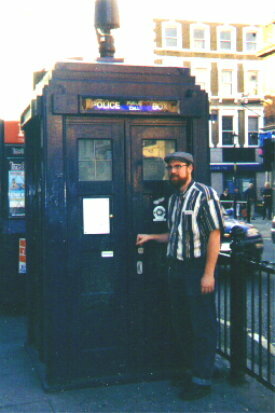 Dr. WHO'S last surviving TARDIS. Unfortunately, he did not have his key along. 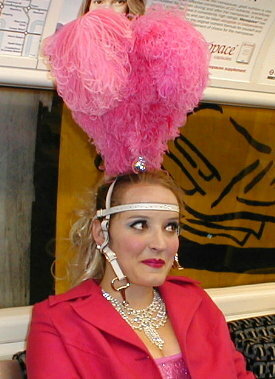 This lady was in the Tube as we traveled to our hotel. Why she was wearing the nice hat was never made clear, but she did seem to be having a good time, and so were we.